Please see schematic below for "installed" dimensions. 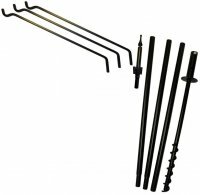 80" Heavy duty 5-piece sectional pole set. 1" Diameter. Includes 3- pole sections, ERTRIO 3 arm extended reach (22") pole top hanger, and a TWISTER twist in ground socket. Need to keep the squirrels off? You need to add a baffle - Our patented SB1D Squirrel Baffle is 100% guaranteed to work! !